Yesterday I had a lovely day at Chelsea Fringe flower market, which was run in association with Greenshoots and the Henley Allotment Association. 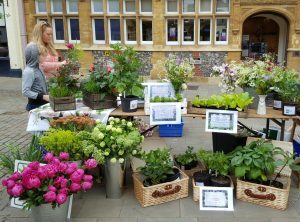 Jane and Victoria both do a wonderful job raising the profile of the Chelsea Fringe in Henley and organised the cut flower section of this market. Chelsea Fringe runs until the 12th of June and has lots of garden-related events worldwide – http://www.chelseafringe.com/. 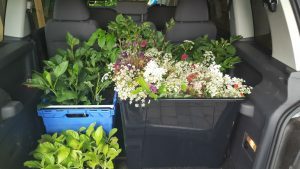 I packed my car to the gills with flowers and plants, and set off to Henley first thing on Saturday morning. Jane and I were positioned beside each other, and our tables complemented each other well. Both showed very different styles of British flowers. Jane had some beautiful, pink, blowsy peonies that caught the eye of everybody passing by. She also had irises, alchemilla mollis, viburnum opulus and achillea and was putting together wonderful, structured bouquets to order. She sold out of the peonies within an hour! My bunches of flowers had an artisan, wildflower slant and they went down very well with visitors to the market. It was wonderful to meet so many people who appreciate this style of flower arranging and I loved seeing how much joy they brought to people. Cow parsley is such a beautiful plant to give flower arrangements a frothy, light touch. When the cow parsley is finished I will start using the ammi majus that I have planted in the allotment to take its place. I sold all the potted dahlias, most of my plants and came home with only 3 bunches of flowers. 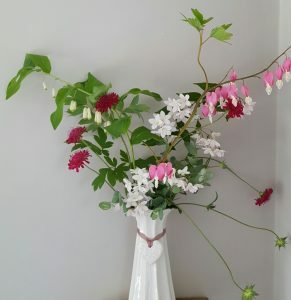 All in all, it was a successful and enjoyable day with the bonus that one of the leftover bunches of flowers is now placed in my bedroom and brings a smile to my face whenever I see it. Even at 4am this morning when my 2 year old daughter decided that it was time to start the day. I have a feeling that today will be a bit less productive than yesterday!